Powers/Abilities: Salome had poorly-defined magic powers. She could put out and turn on the candles' flame at will. She could produce blue lightning able to blind and stun several men at once. She knew how to summon demons and how to control at least one of them (Thaug). She knew how to use some Crystal Spheres to communicate at mid-range, at least 2 kilometers. She had an incredible resistance to mortal injuries but she was not invulnerable, nor did she regenerate her wounds. She had, between her breasts, a mark of a scarlet half-moon. History: (A Witch is born; Savage Sword of Conan#5 (fb)) - Salome was born alongside her twin sister Taramis. They were the daughters of the Queen of Khauran. But Salome had a half-moon mark on her skin, the mark of the witch, a mark that told the ancient curse of the kings of Khauran. So, Salome was declared dead for the people and also for her sister; instead she was secretly taken into the desert and abandoned to her destiny. The new-born child Salome was saved by a Khitan wizard. The old sage wizard brought the baby up until her maturation. Salome learned a lot from him, including the magic arts, and the story of her curse and heredity. Eventually the wizard banished Salome, considering her a common witch, unworthy of the powers he wanted to grant her. Salome planned to regain her heredity. Salome met Constantius, the Supreme Commander of an army of Shemite mercenaries. She chose him as ally to help her in her plans of conquer. Constantius approached Khauran with his army, faking heading to Turan. That night Salome, impersonating her sister Taramis, Queen of Khauran, entered the city and had the Shemite mercenaries spread across the city. She also freed Constantius from his prison, where Taramis had confined him while his army passed away. Then she met Taramis. (A Witch is born; Savage Sword of Conan#5) - Salome told her past and her plans to her sister. Then she let Constantius abuse Taramis, before entrapping her in the deepest prisons. (A Witch is born; Savage Sword of Conan#5 (fb)) - Salome, impersonating Taramis, spoke to the people of Khauran. She declared that she had accepted Constantius' marriage proposal, and released the Khauran army. In that moment, Conan of Cimmeria, Captain of the Guards confronted her. He understood that she was not Taramis and claimed the fact in front of the crowd. Salome had the Shemites attack Conan, the Khauran Guards tried to defend themselves but eventually they were defeated and Conan overpowered, under Taramis laughes. (A Witch is born; Savage Sword of Conan#5) - Salome had Constantius crucify Conan in the desert. (A Witch is born; Savage Sword of Conan#5 (fb)) - Salome married Constantius. Her court became a place of depravation and dissoluteness. The Shemite troops humiliated every woman they desired. The people were heavily taxed and vexed. Many young Khaurans were sold as slaves. Other youths fled, joining the nomads of the desert. The nomads, stronger than ever, started to attack the villages. Salome, always impersonating Taramis, abolished the Cult of Ishtar and filled the Temple with idols of forgotten Gods and Demons, worshipping them. She also personally sacrificed hundreds of victims to her Gods. She evocated a Demon, Thaug, keeping it in a crypt and giving to him human beings. A revolt arose, led by Marcios, once a Khauran soldier, but it failed and he had to flee and hide. (A Witch is born; Savage Sword of Conan#5) - Salome tortured Taramis physically and mentally. A night seven months after Salome arrival Salome showed her sister the head of Krallides, Taramis' most faithful counselor. Then Khumbanigash, the General of the mercenaries and she left the prison talking about Taramis. 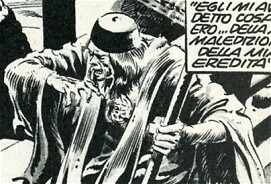 Disguised as a deaf-mute, Marcios learned of Taramis' fate. (A Witch is born; Savage Sword of Conan#5) - A week later, Conan, having survived the cross and now leader of more than 11,000 Zuagir nomad warriors headed to the Khauran capital with his army. Constantius went out the city to attack the Nomads. Salome gave a Crystal Sphere to Zang, a priest, ordering him to follow the Shemites and to give her information about the battle. Salome observed the battle from the Royal Palace for a while, seeing only the far clouds of powder. Calling Zang in another Crystal Sphere Salome managed to contact him and learned that their forces were defeated. Understanding that everything was lost Salome called Zinn and together went to the prison to give Taramis to Thaug. But Taramis had been freed by Conan and some soldiers. Salome blinded them with magic lightning, then Zinn slew the soldiers, stunned Conan and kidnapped Taramis. Conan followed the group; Salome was killing Taramis but Marcios arrived from behind and stabbed her with his sword. But Salome wasn't dead, from her wounds, a floating smoke went out. She woke up and reached the outside of the Temple and with her last words called Thaug. She died on the Temple stairs. Thaug, a black, huge demon was killed by Conan and his Desert Wolves. Taramis was restored on her throne. adapted by Roy Thomas (writer), John Buscema (pencils) and "The Tribe" (inkers). Khauran was ruled by the matrilineal Ashkauri dynasty, so it was very important to establish who was the first-born daughter to decide who was the heir of the reign. Salome got the head of a sage who spoke to the people: Krallides. One night, Salome was seen with a demoniac light in the eyes. Maybe Thomas (or Howard) wanted to suggest that she was possessed by a demon, or she was a demon herself? 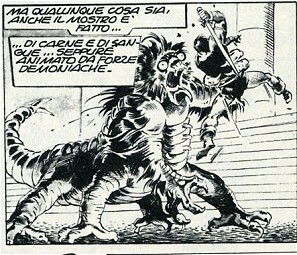 Further, in Savage Sword of Conan#217, Shubal told to Conan the Curse of Khauran. He told that "...one of the first Queens of Khauran slept with a demon to guarantee the independence of Khauran. The guarantee took a counterpart: "a witch shall be born". Every 100 years a Queen bore a female demon, easily recognizable thanks to the half-moon on her breast. These babies were all called Salome and were killed...". I don't know if to put Salome in the class of the half-demons. Moreover, Shubal told the story as if it was of public domain, but in SSC#5 it doesn't seem so. Maybe that only the royal family knew the truth: Ialamis, her cousin Khashtris and Khashtris' bodyguard, Shubal. I would postulate that this Salome is the descendent of the Fallen's Salome. Ivga is a bit more present than in the comics. Further, I am fairly certain that Thaug & Thog the Ancient were related...whether they had any connection to the demon Thog is unclear. Zang has no known connections to any other character with a similar name. He was a wizard and a sage coming from Khitai. He had unspecified magic powers, greater than the abilities he taught to Salome. The Wizard found the new-born child Salome in the desert. He took the baby with him and taught her many things, including the history about Salome the Witch and the meaning of the half-moon mark on Salome skin. He told her of the curse of the kings of Khauran: "The first Queen of the Askhaurian dynasty had traffic with a fiend of darkness and bore him a daughter... thereafter in each century a baby girl was born into the Askhaurian dynasty. 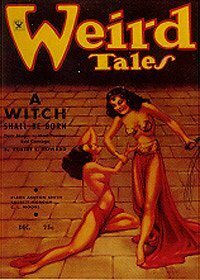 Some of them were killed after being born... other lived as witches... with a scarlet half-moon between her breasts. Every one of them was called Salome, Salome the Witch! Always, a Salome the Witch shall born, also when our civilization will disappear. Always a Salome shall born to entrap the men's hearts... to dance in front of the Kings... and to see the sages' heads fall!". But, when Salome reached maturity, something happened and the wizard decided to banish her, declaring her a common witch, unworthy to possess the deep secrets of the mystical arts that he wanted to teach. Zang was one of Salome' slaves. He was a normal human probably with few knowledge in magic. His skin was yellow-brown. Zang was a priest, so he probably helped Salome in her rites. Zang was instructed by Salome to follow Constantius' army and to use the Crystal Sphere to communicate to Salome how the battle against Conan went. Zang was involved in the battle and wounded. He learned that Conan's siege machines were false and that the Zuagirs had been helped by 3,000 Khauran knights, and that Constantius had been defeated. Zang managed to inform his master but was suddenly killed by an arrow. Zinn was one of Salome's slaves. He probably was a normal human. His cranium was deformed and his face was horrible. Zinn was called by Salome after she learned that the battle against the Zuagirs was lost. Zinn followed his master down to the prisons to kill Taramis, but when they reached the corridor where the Taramis' cell was, they found a guard dead. They heard the voices of Conan and Taramis and waited behind a corner. When the liberators reached them, Taramis blinded them with blue flashes and Zinn slew them with his knife. Zinn transported Taramis in the Temple but Conan reached them. Zinn tried to stop Conan but he was easily killed by the Cimmerian. Thaug was a demon. He was about 4 meters tall and 8 meters long, considering his tail. It had 3 pairs of feet/hands with three fingers per hand and sharp talons, two enormous eyes and a long tail with a talon at the end. The superior part of his body and head were covered by a black, long fur. His strength was far superior to Conan's. His skin, thick, gave him a minimum protection from blades and arrows. Thaug probably was summoned by Salome during her rites and hidden in a crypt under the Temple. He was fed by Salome with the people of Khauran. Thaug was recalled by Taramis after she was mortally wounded by Marcios. With her last piece of life she attracted the monster out the Temple. Conan attacked and wounded it with his sword. 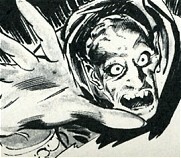 Thaug grabbed Conan in his talons but Conan succeeded in slashing one of Thaug's eyes and was released. Then, the Desert Wolves of Conan entered in the city and reached the Temple. Djebal and the other warriors hit the monster with tens of arrows, and Thaug died. The two Crystal Spheres were magic items that enabled the communication between two persons also at mid distance. Looking and speaking into the Sphere let the other person see, hear, and reply. To function, the subjects had probably to touch the Spheres. Salome gave one of the Spheres to Zang, to be informed about the upcoming of the battle. Zang's sphere was smaller than the one taken by Salome. Later Salome contacted Zang using the greater, floating-on-a-cloud, Crystal Sphere. When Zang was killed the Sphere ceased transmiting images. Salome shattered the greater Sphere on the floor.